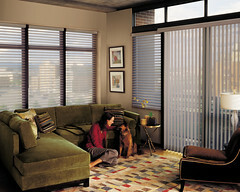 I remember over ten years ago when remote control and wireless window coverings started hitting the market. We see every day how technology is moving so fast(eg. cell phones) and what one had a year ago has been replaced maybe once or twice since. So imagine the technology in the window covering business ten years ago and what has happened to us. Needless to say, it is so far advanced that consumers like you and me just don’t realize what is available for literally and figuratively pennies more. Well, this isn’t entirely true because I as the author realize it and hence why I am writing today. The very first technology involved batteries and infra red beams. Batteries are still around in the headrails of blinds, shades, and shutters. But the batteries are longer lasting and less obscure than ten years ago. Ten plus years ago one would have to point the remote control and it would have to be lined up almost perfectly to get the blinds and shades to move. Plus, you could not be far away as in one room to another to make it work. Today, radio frequency is in and you could literally be in another room with walls in front and the window coverings will raise and lower with a simple press of the button. Another option is to have electrical wiring tied into the window coverings. Just like putting a wall switch in for lights to be turned on and off, a wall switch can be put in to raise and lower your window covering products. Timers are also available for wireless window coverings. One can program based upon the sun rising and lowering or being in and out of town the window coverings to move at certain times of day. You can also program the blinds and shades to go up and down based upon the temperature control of the heat coming in the windows. The list goes on and on. Are Wireless Window Coverings for Everyone? Well, of course not. Just like all technology, there always can be issues. But, the issues are a lot less cumbersome today than ten years ago. Oh one last thing….do you use a remote to control your television in your home? My guess is that the majority of you answered yes. Them why not have the same concept for window covering and the good news is that just like televisions over time, the cost is minimal.